I have already presented three models of how Prayer, Power, and Proclamation might work together but there is a fourth model that comes closer to describing what how Jesus appeared to minister. Jesus was full of the power of the Holy Spirit and he ministered it to others in accordance with the will of the Father. Peter received power from on high and ministered it to others. Stephen was anointed, as was Paul. The key element in this model is that we serve not only as intercessors, conduits, or carriers, but as stores of supernatural power. We do not generate this power; the Holy Spirit imparts it to us. However, once we have received it, we have the ability to impart it to others. Acts 6:8 records that, “Stephen, a man full of God’s grace and power, did great wonders and miraculous signs among the people.” It does not state that God did wonders through Stephen, or that Stephen attested to the miracles which he observed God doing. It states rather that Stephen did great wonders and miraculous signs. Acts 8:6 also records that, “when the crowds heard Philip and saw the miraculous signs he did, they all paid close attention to what he said.” Both Stephen and Philip performed miraculous signs. Not only does this model conform most closely to the evidence of Jesus’ ministry and that of the apostles, but it is compatible with the concept of ‘sonship’. We are children of God, and as such we are stewards of his resources. God entrusts us with responsibility, possessions, talents, and power. The principle of stewardship applies to ministries in general and to such things as financial giving in particular. God entrusts us with ‘talents’ (Matthew 25:14-30), yet surely the greatest thing he gives to us is ‘power from on high’. The Holy Spirit anointed Jesus when he came up from the waters of baptism, and he then dispensed this power in many different ways. Peter received power from on high on the day of Pentecost, and he too dispensed this power to those in need. The stewardship/sonship model is consistent with the whole idea of human discretion. God grants his children a considerable degree of freedom of choice. Why does he do this? He does it so that we can learn to be faithful sons and daughters. He entrusts us with money, talents, and ministries. He also entrusts us with anointing; with Holy Spirit power. The concept of stewardship centres on responsibility. Regarding the stewardship of spiritual energy, this model suggests that we are stores of power rather than just conduits. A good analogy is the rechargeable battery. A battery stores electricity and releases it when needed. Once charged, we can operate the battery independently, and we only need to reconnect it to the power source when we need to recharge it. The analogy breaks down at this point, because, unlike a battery, we have the ability to choose when to discharge the energy we store. The point is, though, that if we were not able to store spiritual energy, then we would have no discretion in using or withholding it. Does this mean that the one requiring ministry can only receive as much as you have to give? Jesus received the fullest possible anointing, but what about us? We are just ordinary Joes! Let me repeat the truth that God can and does work through us, or independently of us. He does not need us as his ‘hands’! He is quite able to minister to whom he will, when he will, and how he will. But, he has chosen to empower his children to minister so that we can grow up to be like Jesus! He expects us to give whatever we have – that is all we can do. Peter said to the lame man, “what I have I give you”. I believe that as we give what we have, we prepare the spirit of the recipient for receiving much more, directly from the Holy Spirit. I call this ‘priming the pump’. When I was a boy, I came across water pumps which needed priming before they could operate properly. They worked by creating a vacuum into which water flowed. If there was air in the pump, then it would take time and effort to get the water to flow. To make things easier for the next person, users were required to fill a tin mug with water before leaving the pump. The next person would pour that mug of water into the pump, filling up the space occupied by air and thus making it much easier to pump water. 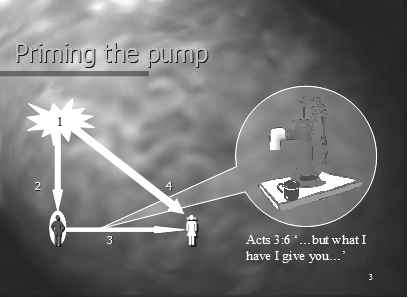 In response to our prayer requests, the Holy Spirit (see diagram), imparts a measure of power to us. We then minister whatever we have received. This little impartation primes the pump of the person in need, who is then able to receive a powerful input of power directly from God. Much traditional Pentecostal thinking concerning the anointing holds that believers are ‘baptised in’ the Holy Spirit early on in their lives as reborn Christians. Pentecostals, and many Charismatics, see this empowerment as a once-off experience. At the other end of the spectrum are those who believe that Christians have no ‘power’ within themselves. Instead, they are merely servants of God who act as conduits for his power (Model Two). 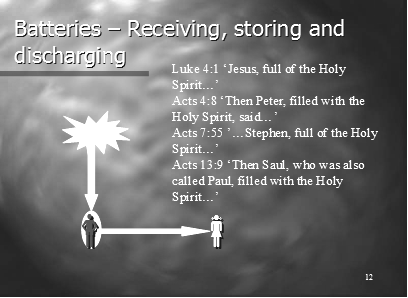 A third view is that at rebirth Christians receive the indwelling presence of God the Holy Spirit, and that any subsequent spiritual ‘power’ experiences are simply ‘releasings’ of the Spirit (Model Three). These options all contain elements of truth. We certainly need the Holy Spirit to fill us with power from on high. The first time this happens is often dramatic and memorable, and many would refer to this experience as being ‘baptised in the Holy Spirit’. Often these, and subsequent experiences, are facilitated through the laying on of hands, and are sometimes accompanied by prophecy or praising God in tongues. Even if we consider ourselves stores of spiritual energy, rather than conduits, we cannot escape the fact that we are, in the final analysis, dependent on God the Holy Spirit. There is no evidence in scripture that we generate spiritual power. The Holy Spirit imparts his power to us. However, once we receive it we are responsible for using it, and like other forms of energy, it depletes. We lose energy by using it for our own benefit, by giving it to others for their benefit, or simply by ‘leaking’. We need to return often to the Holy Spirit to be recharged. If we have not used the anointing in accordance with his will, then he may well refuse to entrust us with more until we have learned to obey him. As I have indicated already, I have a problem concerning the idea that, based on the belief that the Holy Spirit takes up residence within us when we are born again, any manifestations of spiritual energy are merely ‘releases’. The Holy Spirit is a multidimensional being, whilst we are spatially three-dimensional beings. As I have already stated, he can position himself anywhere spatially, and the constraint of our perception of time does not limit him. In this sense, he can be ‘in’ us as much as he can be ‘with’ us. This is not where I have a problem. My concern is with the notion that we can ‘release’ him at will. We can release any energy which he chooses to give us, but we cannot even dare to think of releasing him as though we, and not he, were divine. The belief that the Holy Spirit is limited by his human ‘hosts’ is abhorrent to me, and is, in my opinion, another manifestation of prideful sin. I want to turn your attention in my next blog to the process of receiving power from on high, so keep posted!